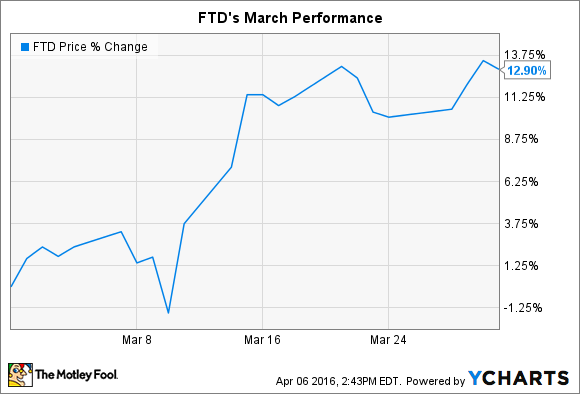 The sales growth outlook is weak, but FTD should return to profits in 2016. What: Floral and gifting giant FTD (NASDAQ:FTD) saw its stock rise 13% in March, according to data provided by S&P Global Market Intelligence. The boost helped shares recover some of their recent losses, but investors are still down roughly 10% over the last year compared to a 1% decline in the broader market. So what: March's bounce was powered by quarterly earnings results that showed the company is struggling to find growth in its core operations while at the same time incorporating the massive Provide Commerce business it recently purchased. Sales shrank by 5% in FTD's direct-to-consumer segment over the holidays and by 3% in the new Provide Commerce segment. Yet profitability surged in the new division, with operating margin more than doubling to 9% of sales from 4%. "We are pleased with our strong 2015 financial results," CEO Robert Apatoff said in a press release, "given a challenging consumer environment." Now what: FTD aims to keep improving profitability for the Provide Commerce business to bring it closer to its core 12% operating margin. That growth should power a return to profits after an $82 million loss in 2015 -- net income should rebound to $10 million this year. Sales growth will be hard to come by, though. Apatoff and his team project that revenue will decline slightly in 2016 as its growth initiatives, including a new flower site called Roses.com and a partnership with greeting card titan Hallmark, are offset by a significant decline in Valentine's Day business. This fiscal year that holiday fell on a Sunday and had to compete with President's Day and a closer placement of the Super Bowl. Those headwinds disappear in 2017, though, when Valentine's Day comes on a Tuesday.